Burleigh Brewing is thrilled to support the first GC Laughs Festival, a week long celebration of non-stop comedy with a dazzling line-up of the funniest international stars, homegrown legends and next-big-things in comedy. GC Laughs founders Craig Ivanoff and Josh Armstrong have for the first time created a comedy festival bringing joy, big belly laughs and wide smiles to the Gold Coast. The festival kicks off on March 17th at Home Of The Arts and will run until Sunday 24th with over 24 comedy acts over seven days! Check out the program here. GC Laughs launched its festival at Burleigh Brewing on Thursday 21st of February with a jam packed comedy show featuring renowned comedians Luke Heggie, Randy the purple puppet, Aaron Grocs, Sam Campbell, Ellen Briggs and Bob Franklin. Locals by the hundreds laughed the night away in celebration of comedy whilst enjoying Burleigh world class beers from the tap! 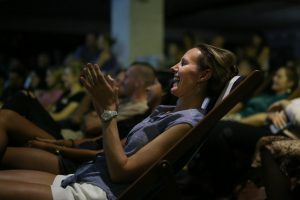 Burleigh is stoked to introduce comedy to the creative events line up this year to sit along side Burleigh Outdoor Cinema, Brewing Local Artists and Burleigh Surf:Craft. Stay tuned for more.